Good luck to Logan today as he represents CrossFit 970 in the 16-17 year old division at the 2018 CrossFit Games!!! His heat times are 7:40, 11:30 and 12:40. 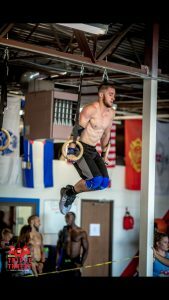 Go to games.crossfit.com to stream it live. This workout is a core burner. The 30 lat sit-ups will make the bear crawl and handstand walks more difficult than usual. Use the first 200 meters of the 800 meter run to recover a little and turn up your pace as much as you can on the final 600 meters of the last 2 rounds. Each person will start at one end of the pull-up cage and crawl or walk 25 feet to the other side of the gym and 25 feet back to the cage. Bear crawls will go down and back twice, handstand walks will go down and back. If you’re uncertain on whether or not you should walk on your hands for this one, ask your coach.